The chief of America's Federal Communications Commission is not a fan of net neutrality. So what's his vision of communications and digital policy in these times? 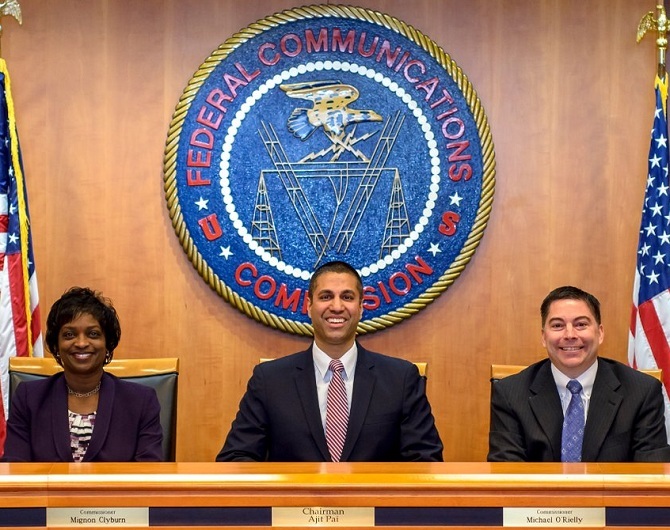 When the time came for United States President Donald Trump to name the chairman of the Federal Communications Commission, FCC, the choice was quite simple. Ajit Pai, the Republican who served as an FCC commissioner during the second Obama administration and emerged as a strong voice against net neutrality. Despite its lack of a high profile, the indispensability of the Internet in our lives makes the FCC one of the most influential US agencies. 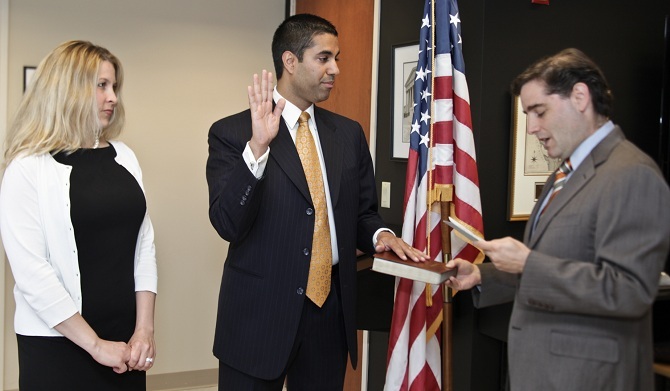 In his inaugural remarks as FCC chairman, Pai, 44, said he was blessed to head the position and think big. 'I believe one of our core priorities going forward should be to close that divide -- to do what's necessary to help the private sector build networks, send signals, and distribute information to American consumers, regardless of race, gender, religion, sexual orientation, or anything else, he added. As FCC chairman, Ajit Pai has already issued a decision that prevents nine Internet service providers from using a federal programme to provide discounted broadband service to the poor. 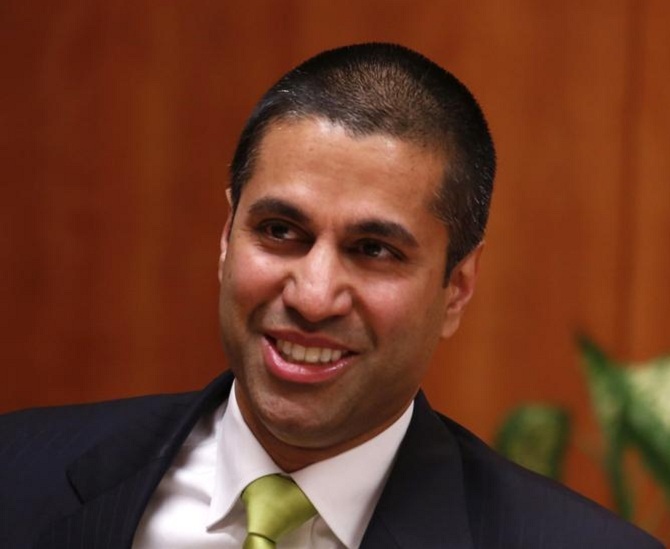 While many fear that this appointment could lead to the open Internet order of 2015 -- which was in favour of net neutrality -- being repealed, we revisit Pai's interview with a Rediff publication when he was the FCC commissioner to understand what makes him tick. FAQ: What's net neutrality? How does it affect you? Was this position something that you aggressively sought or would you say it was a sort of natural evolution, considering your track record in an earlier incarnation at the FCC as deputy general counsel, and also in the private sector this was the field you were engaged in? I would say that I was interested in the field for quite some time, starting with my work at the Department of Justice in the Anti-Trust Division, beginning in the late 1990s. But getting this position was never something that I planned. I was very fortunate to receive a call asking me if I'd be interested in interviewing for the position in 2011. I had just started working at a law firm -- in fact, that was my first day. So, I never predicted or expected or aggressively sought this position. I was very lucky to have a series of experiences along the way that made my profile interesting. Because this was the field -- even when you were a Congressional staffer -- you were immersed in? Yes, very much so. I really enjoyed the technology field. It's changing so quickly and there is so much room for policy -- to affect it in a positive way. So, I've very much enjoyed it over the last several years. How did you get onto this field? Was it purely an insatiable appetite for technology or was it also the political bug and/or public service? It was a little bit of an accident. I've always enjoyed technology just as a person. But in terms of my legal training, I had an interest in anti-trust law. So, I was speaking to the judge I was working for after law school about what I should do next. He recommended that I apply to the Anti-Trust Division of the Department of Justice for the honours programme, and if you are lucky enough to get that position, you have to pick which section you want to work in. At the time the Telecommunications Act of 1996 had recently been passed, and he said, it might be interesting if you work on anti-trust issues as applied to the telecommunications field. Much to my surprise, I ended up falling in love with the field and I've held that love ever since. But I guess it can get pretty technical. It can, and one of the great things about this job is that I have the ability of -- if I have a question of how something works -- to call up or visit with the people who know how it does. For example, I had a question about how cable networks operate. So, I had a chance to visit Cable Head-In to see all the equipment that transmits all the signals away from your remote control all the way back to the Internet. Having the ability to access that kind of information, understand how networks operate is so valuable, especially for someone like me who's not an engineer by training. Your Wall Street Journal op-ed (in February 2014) about the FCC's 'critical information needs' -- which planned 'to send researchers to grill reporters, editors and station owners about how they decide which stories to run' -- resulted in the FCC pulling back. What made you feel so strongly about it, and did you consider yourself a whistleblower? I didn't consider myself a whistleblower. I considered myself to be a typical American citizen who cherishes the freedom of the press. So, whenever the government or research funded by the government, goes into newsrooms and starts asking questions about what the news philosophy is, why they choose to cover some stories and not others, and dictates what eight categories of news the American people need, and try to figure out if news stations are fulfilling those eight needs, that's something that raises a lot of concerns. So, I think what we saw in that controversy about that SIMS study, as it is called, is the fact that people from all across the political spectrum want the press to remain free and they don't want the government to even hint at intruding upon that freedom. There are critics who argue that it was politically motivated, since you are Republican. That policing newsrooms was not the study's intent, but that you were playing to the likes of conservative radio and Fox News. How do you respond to such criticism? I am grateful to the critics for assuming that I had a grand strategy -- that there was a big conspiracy afoot in this office when we rolled out that op-ed. But to be honest, the op-ed had a very simple message and that message was contained in the op-ed itself. I believe that's one of the reasons why, for example, President Clinton's counsel Lanny Davis started banging the drum and saying, look, people with left to centre views should share the concerns of Commissioner Pai. I think we did see a lot of people from the left as well as the right showing that concern. To be honest, I didn't see it as a political question as more as one of a constitutional policy question. It's always useful to think of the hypothetical. If it was a Republican administration, would people on the left be comfortable with the government intruding into newsrooms and saying, 'What's your news philosophy?' I don't think so. We have to be as objective as we can and ask, should the government, whoever is controlling it, have this kind of intrusion into news across the country? Why are you so zealously protective of any kind of Internet regulation? Even though the Web has revolutionised our lives, there are the cons too? What I am against, is getting rid of the bipartisan framework that has governed the Internet for the last 20 years, and I believe President Clinton and Congress in 1996 got it right that we want to have an Internet that is governed by the free market unfettered by federal or state regulation. The benefits of that have been obvious, especially if you compare it to other countries or other continents. So, for example, in Europe, broadband deployment has decreased and mobile broadband in particular, is very hard to come by and you look at the United States, we take mobile broadband and wired broadband now not for granted, but it is much better than it is anywhere else. That is a direct result of the fact that we have had a historic bipartisan agreement that we don't want the Internet to be saddled with some of the common carrier regulations as it is called from the telephone era where you had a monopoly operating a copper network. Now we live in the Internet Protocol world where it takes a lot of investment to take those broadband networks and the networks are now very competitive and that's something that once you cross the Rubicon -- so to speak -- and you start allowing the government to start regulating the details of the network deployment, operation, then you are going to see the private sector not willing to take quite as many risks and then the broadband industry is going to suffer as a result. Have you always been so passionate about being against regulatory barriers -- and is it solely because you are convinced they are the bane of infrastructure development? I don't oppose every single regulation, but my view is shaped in part by my own experiences. I remember when I was a child thinking that it was ridiculous that my grandmother had to reserve a 10 minute block of time in her Bangalore post office for us to be able to call her. It was expensive for us as well. A highly regulated system where the government was essentially dominating the entire industry. Over the last 30 years, what we've seen, at least in this country, is the fact that when you have a light touch of regulation to make sure that there is no anti-competitive behaviour and consumers are protected, but beyond that we let the free markets operate, we've seen the benefits of that. Now, the fact that you have a mobile app that allows you to do something you never could have done 30 years ago and the fact that you now have broadband access in all parts of this country, that's a tremendous accomplishment for the private sector. It wouldn't have been so had the government not had a more restrained view on how to regulate the industry. You also fervently believe that the FCC should allocate additional spectrum for mobile broadband? Why? Because one of the things I've seen, especially having gone to India, and talked to them about spectrum policy, one of the great success of the US has been in the deployment and adoption of high-speech wireless services, and now for example, the US is home to almost half of the world's 4G LTE subscribers. That's just incredible and we only have 330 million people. The reason is because we have allowed there to be a free market for spectrum. We have what's called a flexible use policy so that we don't dictate that this slice of spectrum can be used only for this purpose and this slice for that purpose. We let the private sector decide how to meet consumer demand. We also pioneered the use of competitive auctions. There used to be that all these different companies would apply to get the use of a certain kind of spectrum and the government would decide behind closed doors how to allocate it. Now, we have an open, fair and transparent process, by which anyone can say, I want to bid on this spectrum and if they pay for the right to use that spectrum, the government gives it to them. That's the model now we are seeing replicated all over the world, including in India. Coming to some personal and community issues, both your parents are doctors (Varadaraj Pai, a urologist from Secunderabad, and Radha Pai, an anaesthesiologist from Bengaluru). How did they feel, when you got interested in social studies and went into law, public service and then became a political appointee? It's incredible how much has changed. The desis of our generation, it was expected that we went into medical school or engineering, or some sort of science, and that was the well-trodden path for a reason. So, yes, when I first realised that I liked the humanities and decided to pursue that in graduate school and then law school, I was a little afraid to be honest with you. And, at that time, I guess there weren't too many Indian-American role models either in these so-called non-traditional fields as far as the older generation was concerned that may have alleviated some of their concerns when their children were exploring areas like humanities, like you did. You are absolutely right -- very, very few. My law school class, there may have been five Indian Americans and there certainly wasn't a South Asian American Law Students Association for the entire country like there is now with NASABA (North America South Asian Bar Association). It was a very different time. Now, recently, when I had a chance to go to Philadelphia and speak to the students at U-Penn, it's incredible to see how many of them are Indian American and how unremarkable it is that they take it for granted that they could have gone to business school, law school, medical school. That's a great thing. It shows that the Indian-American community in the US has really developed and it is taking its rightful place at the centre of a lot of the economic, political and business communities in this country. I guess over the years, as you've evolved in your career, your parents, like a lot of other first generation immigrant Indian-American parents, have begun to not only understand and now view with pride the public service careers of their children but are probably even encouraging them in such pursuits now. Absolutely. At the time, they were a little but worried. They didn't know what lawyers like us in public service did. They thought of medical malpractice law or something of the sort -- essentially private practice would have been what they would have liked. Even now, there are times, when my mother worries. When I told her that I would be leaving the law firm job to take this job, she asked if it's a full-time job, do you get paid, etc? So, still a little bit worried that I may be moving back into their house (laughing uproariously). But, at the same time, they take so much pride and to see them, for example, at my Senate confirmation hearing, to be able to recognise them for all the sacrifices that they've made for me to be in that position, was just one of the most gratifying things of my life. My parents certainly didn't come from much money at all in southern India, and so, within a couple of generations to have gone from my grandfather on my mother's side, who didn't have the money or the ability to go to college, to a grandson, me, being able to be nominated by the President of the United States, it's just really incredible. Like the first Indian-American federal judge in the US, Sri Srinivasan, who grew up in Lawrence, Kansas, you also grew up in a small rural town of Parsons in Kansas, where your parents relocated to from Canada after their medical residencies. Judge Sri believes the small-town perspective was what gave him the humility and understanding of what life's all about in terms of interactions, especially for new immigrant families? Did it have that kind of effect on you too? It really did. I am not surprised that Sri said that. A lot of us had the same impression -- that there's something about growing up in the mid-West at that time. It was very useful, it taught us a lot about life and about how to treat other people, because people there are generally very friendly and open. At least for me, I was a little bit on the shyer side when I was a child and it gave me a chance to know who I was and blossom without the pressure of living in a huge city with its big buildings and people rushing around all the time. It was a little quieter and that's what I needed at the time. How important is it for Indians Americans to be in public service or have at least a stint in the public arena at some point in their life and career? I believe it's absolutely critical and even if a critical person doesn't share my political views, I nonetheless believe it is important for them to make their voices heard. I remember what it was like when I was a child, you never saw anybody in public office who looks like you, talks to the community you are part of, and you so often felt excluded. So, I believe one of the great things about Sri becoming a judge, seeing other people in office like Governor (Bobby) Jindal in Louisiana (the first American governor of Indian origin) for instance, we are now entering the public square in a way we never did before, and that's such a great thing and desis have just as much to contribute to the public discourse as anybody else. I think it's just wonderful. This interview was first published in India Abroad, then a Rediff.com publication. Ajit Pai had spoken to Aziz Haniffa. So how does Airtel Zero violate net neutrality?